So here’s a confession: Until a few months ago, I didn’t like shrimp, or many other seafood dishes. I know, I know, what kind of a foodie am I to disregard a whole type of protein? 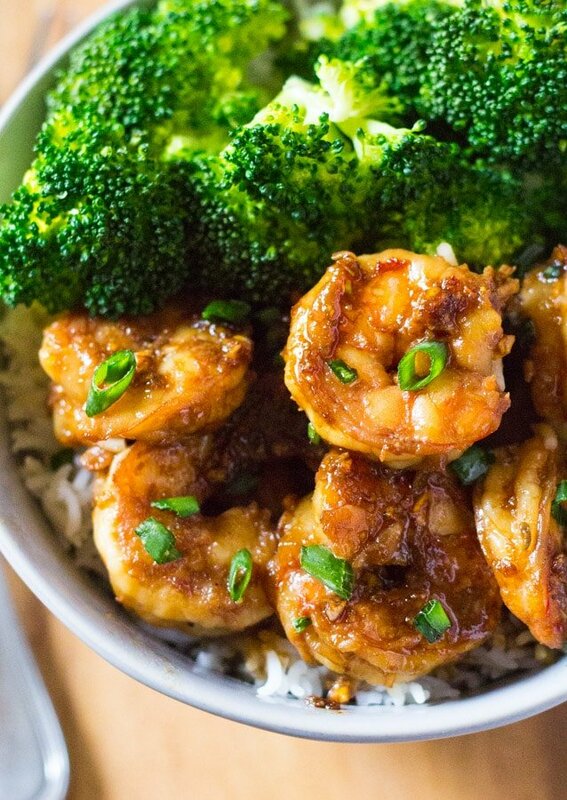 But then I came across this recipe for Honey Garlic Shrimp, and all that glossy, sticky sauce looked irresistible to me. After all, I am a big fan of anything honey + garlic. Also, a delicious dinner ready in 15 minutes? That’s a total winner in my book. Plus, I think I’ve had too many Butterscotch Chip Pudding Cookies in the past week or so, and also one or two slices of this amazing delish apple cake I recently tested in my kitchen. So I think it’s about time that we had something healthy for dinner, right? 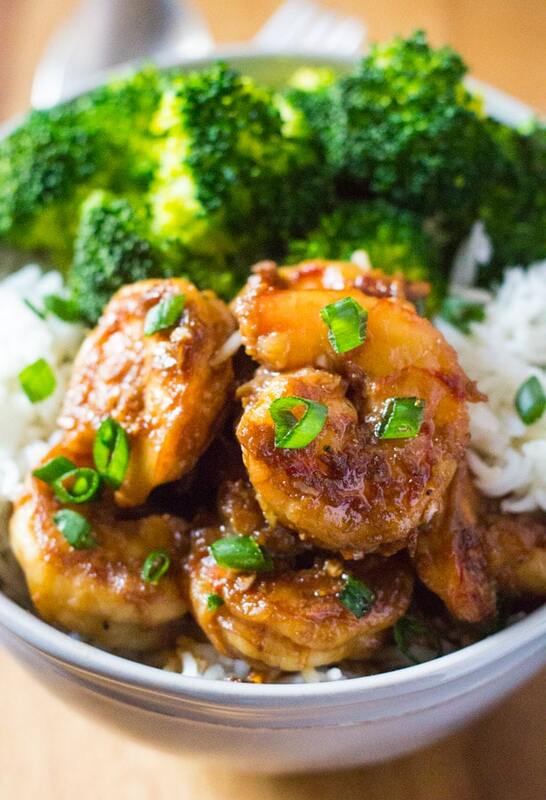 Not only is this Honey Garlic Shrimp, amazingly delicious, it is also healthy. Seriously, what could be better than such a package? Nothing, I guess. 1.) Make sure you get peeled and deveined shrimp. You can leave the tail on if you want, but I got it removed from my seafood guy at the supermarket. I used jumbo shrimp. I would also suggest using fresh shrimp for this recipe, but frozen should work fine too. 2.) The recipe requires you to make a marinade for the shrimp. The shrimp is marinated for about 10 minutes in half of the marinade, and the rest of the marinade is reserved for the sauce. Discard the used marinade (in which the shrimp was marinated) and just use the reserved marinade for the sauce. 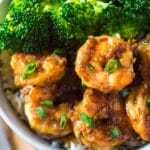 This 15 Minute Honey Garlic Shrimp is a perfect delicious and healthy weeknight dinner, which your whole family will love! In a medium sized bowl, whisk together the marinade ingredients: honey, soy sauce, minced garlic and minced ginger. Add the shrimp in a ziplock bag, and pour over half of the marinade, while reserving the rest. Marinate for 10 minutes or overnight. In a skillet, heat oil over medium high heat and place the shrimp in the skillet, discarding the leftover marinade. Cook the shrimp on each side for about 45 seconds. When you flip over the shrimp, add the reserved marinade and cook for an addition 1-2 minutes. It is very important to not overcook the shrimp, so make sure you don't cook it for too long! 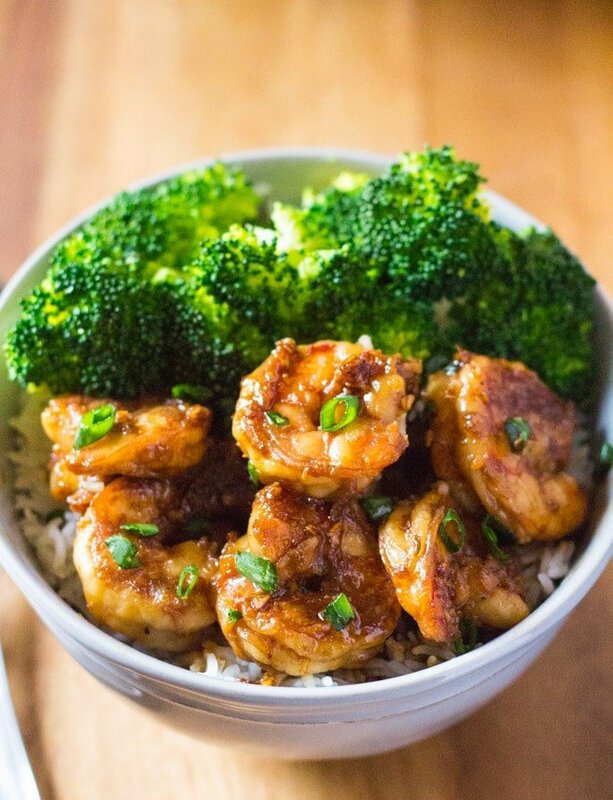 Serve immediately with rice and steamed broccoli. JUST FOUND YOUR WEBSITE AND SIGNED UP VERY IMPRESSIVE, GREAT INFO AND RECIPES. I CAN’T WAIT TO ORDER, HAVE TO MAKE ROOM IN FREEZER FIRST AND ALSO GOING THROUGH SOME MEDICAL ISSUES.